Rooms Online asked Les Morgan to offer you, our audience, his personal insight surrounding revenue management as a vital part of business operations. Read below as Les offers his advice regarding the importance of revenue management for running a successful accommodation business, whether big or small. WHY IS REVENUE MANAGEMENT IMPORTANT FOR ACCOMMODATION PROVIDERS, INCLUDING SMALL TO MEDIUM OPERATORS? The risk to any accommodation business not giving this area of running the business significant resource is that they can leave money on the table. Travelers are progressing to shorter booking lead times and this opens up the opportunity for flexible pricing. The speed of which potential guests react to special event or business travel has never been faster and a business can only meet this by having systems in place to maximise the demand. Any delay in responding to interest will leave a business behind their competitors. The market is now very advanced. Clients are sophisticated and expect a high level of service especially online. The complexity required of systems in order to meet these expectations means that a business must have sufficient ability in this area. If the commitment to Revenue Management is not enough an operator will be simply fall short of their potential financial returns. With the assumption that a businesses fixed costs are ever increasing, the obvious path to increasing profit is to maximise revenue. In a growing market the opportunity exists to do so. Furthermore, any revenue increase may permit reinvestment and in a buoyant environment those properties that are able to offer superior physical settings will be able to command premium prices. No matter what the size of a property (big or small), the internet has provided the opportunity to compete with all accommodation providers. To some degree it’s leveled the marketing playing field however the chance is lost if revenue optimisation is not deployed. The approach need not be urbane but it requires considerable and constant attention. WHAT ARE SOME COMMON MISTAKES YOU SEE WITH ACCOMMODATION OWNERS AND THEIR REVENUE MANAGEMENT? The most common mistake is that the pricing is not relevant to the demand. Misreading the market can be costly. It’s important to keep informed about the industry trends, the general economy and the competition. Guests seek value for money, and offers that don’t match price demands will be harshly dealt with by online reviewers. WHY DO YOU SUSPECT SOME OPERATORS SHY AWAY FROM DYNAMIC PRICING? There may be some operators who have the view that it’s simply easier to have a static rate than employ a variable one or they think that guests will resist a dynamic rate viewing the operator in a poor light. There is also a misconception among a small minority that a dynamic pricing model leads to lower profits. The fact is that dynamic rates exist in most businesses all over the world. Therefore, our guests are comfortable with the concept. Good businesses amplify their profits in high demand periods and strive to create demand in opposite conditions. If your prices standstill there may be a perception that your business in general is too. WHAT ARE YOUR TOP TIPS FOR ANYONE NEW TO THE INDUSTRY WITH NO EXPERIENCE IN REVENUE MANAGEMENT? Revenue Management is critical to our sectors success. Individuals who are skilled in this field are highly sought after and consequently well remunerated with strong career paths. Any opportunity to learn more about this discipline should be enthusiastically pursued. Revenue Management is largely a science with a degree of art. How good to be to be in a role where you are required to utilise the latest technology and apply rare common-sense. 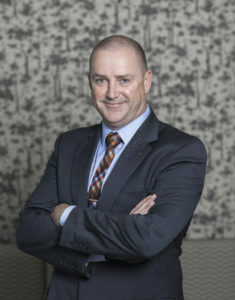 Les Morgan is the Chief Operating Officer of Sudima Hotels and Hind Management. The group has an annual turnover in excess of $50m and employs over 450 people. Les recognises that whilst commercial success is a primary function of any business, strong organisational values and community empathy are vital ingredients to a healthy prosperous company. Les is a previous recipient of a Westpac Excellence in Leadership Awards, was the 2018 winner of NZ Hotel Industry Senior Hotel Executive Award, and recently received the Tourism Industry Aotearoa, Tourism Industry Champion Awards.